Welcome to Anne Emery's web page. 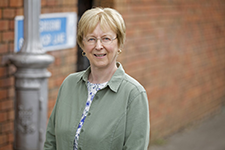 Anne Emery is the author of Sign of the Cross (2006), Obit (2007), Barrington Street Blues (2008), Cecilian Vespers (2009), Children in the Morning (2010), Death at Christy Burke’s (2011), Blood on a Saint (2013), Ruined Abbey (2015), Lament for Bonnie (2016), and Though the Heavens Fall (2018). Anne was born in Halifax, NS and grew up in Moncton, NB. She is a graduate of St. F.X. University and Dalhousie Law School. She has worked as a lawyer, legal affairs reporter and researcher. Anne lives in Halifax, and travels frequently to Ireland and other favourite destinations. To hear Anne's interview with Shelagh Rogers on CBC's The Next Chapter, click here (MP3 download). 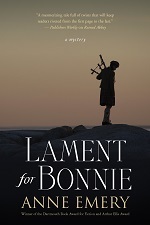 Lament for Bonnie: Reviewers have called the new book "an engaging mystery" and "irresistible" (Publishers Weekly), "a fine mystery with terrific characters and a solid plot, an irresistible read" (Globe & Mail) and referred to its "soaring narrative arc" (Celtic Life International). 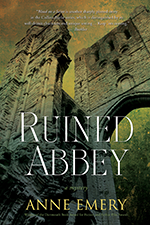 "Eighth novel in the excellent Father Brennan Burke series ... a really tightly plotted historical with solid characters and the elegant style we expect from Emery." - Margaret Cannon, Globe and Mail. Anne's latest novel, Though the Heavens Fall, has been shortlisted for the Arthur Ellis Award for Best Crime Novel. The award is presented by the Crime Writers of Canada. 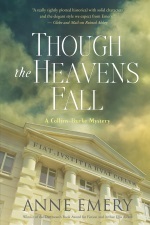 Ellery Queen Mystery Magazine reviewed Though the Heavens Fall: "The dialogue is smart and the story brutally emotional." See Reviews section for the book. Anne's tenth novel, Though the Heavens Fall, has been rated "Clearly ... one of the finest reads of 2018" by Jim Napier, in a review on The Rap Sheet. The Hamilton Spectator calls it "another excellent novel." And Booklist says, "Fans won't want to miss this strong installment in a fine series."